Wed, Jan 16, 2019, 11:10 am SL Time, ColomboPage News Desk, Sri Lanka. 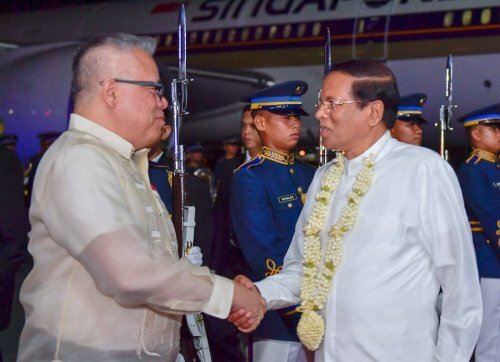 Jan 16, Colombo: Sri Lanka and the Philippines will sign six Memorandum of Understandings during the Sri Lankan President Maithripala Sirisena's visit to Manila this week. 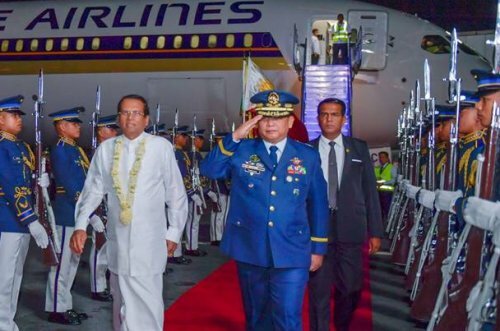 President Maithripala Sirisena on an invitation of Philippines President Rodrigo Duterte commenced a four-day state visit to Manila on Tuesday, marking the first visit by a Sri Lankan head of state. During his visit to Philippines, the President is expected to further strengthen the political, economic and cultural ties between the two countries and the two countries will sign six Memorandum of Understandings to enhance bilateral ties in many fields. The MoUs include focus on broader areas of agriculture, fishery and dairy and animal husbandry, tourism promotion, foreign employment cooperation, higher education, and defense cooperation. Cabinet this week approved the MoUs to be signed. Commencing the state visit, the President will pay floral tribute to the Philippines�s National War Heroes Monument, today (16). Later, President Sirisena will hold bilateral discussions with his Filipino counterpart President Rodrigo Duterte at the Malacanang Palace. Their discussion will focus on enhancing decades-long cooperation between the two nations. President Sirisena is also scheduled to visit the Asian Development Bank Headquarters in Manila and the International Rice Research Institute in Los Ba�os and the President will hold bilateral discussions with the President of the Asian Development Bank Takehiko Nakao.